If you have ever smelled a sour milk, then you know how nasty odour it has. Spilled milk that has set in a carpet for a few days not only can leave that nasty odour behind, but it also can be extremely difficult to remove. Fortunately, most stains and odours can be successfully removed with common household items while you are using the right cleaning technique. Here are some simple methods suggested by carpet cleaning Clapham team. Treat the spill as soon as you notice it. Soak up excess milk with paper towels or a white cloth. Pour plain water on dried milk stains, then blot repeatedly. Proceed with one of the following solutions when no more milk comes out of the carpet. 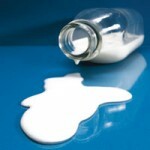 Cover the area affected by milk with baking soda, and allow it to dry for 24 hours before vacuuming the area. Baking soda eliminates odours and freshens carpeting. Another solution is to pour a small amount of white vinegar on the stain. Let the vinegar set for several hours, then blot it up and rinse the carpet with cold water. Turn on a fan against the area to help it dry. The smell of vinegar will vanish once the carpet dry and the odour of sour milk will be gone. Coffee grounds can be used on dark carpets, according to carpet cleaning Clapham squad. Sprinkle some coffee grounds on the affected area and let set for a day or two before vacuuming the area. If the sour milk odour persists regardless the applied home remedies, purchase a pet odour remover from a local pet store. Follow the manufacturer’s instruction on the bottle. The pet odour remover will break down the milk stain and eliminate odour-causing bacteria.